packetqueue.net — Page 11 — Musings on computer stuff, and things… and other stuff. Oh, and keep up with real-time infor­ma­tion on twit­ter where I hide behind the han­dle @someclown, or G+ where I can be found at: http://gplus.to/someclown. So, nos­tal­gia about com­put­ers and the “good ole’ days” gets strong with me when­ev­er I turn on my old Apple II, or pull out any old mag­a­zines from the ear­ly 80’s or 90’s. 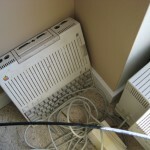 My wife laughs at me because I still get goose­bumps and a light in my eye describ­ing how I felt when I first saw the Apple IIgs or the Ami­ga 1000, and how bad I want­ed them. It takes me back to when com­put­ers were fun, mag­i­cal, and rep­re­sent­ed a brave new world to my young mind (with apolo­gies to Aldous Hux­ley). So it is with great excite­ment that I now have in my pos­ses­sion a book on that ear­ly time, writ­ten about one of the pio­neer­ing com­pa­nies sub­ject to more his­tor­i­cal revi­sion­ism than most peo­ple real­ize. “Com­modore, a com­pa­ny on the edge” by Bri­an Bag­nall is an in-depth, inter­est­ing, and more his­tor­i­cal­ly accu­rate por­tray­al of the ear­ly his­to­ry of micro­com­put­ers in gen­er­al, but Com­modore in par­tic­u­lar, than many I’ve read. Most ear­ly his­to­ries are writ­ten by revi­sion­ist authors like Robert Cringe­ly and tend to dra­mat­i­cal­ly over­state Apple and IBM’s con­tri­bu­tions at the expense of Com­modore and Atari, among oth­ers. I’ll post a com­plete review when I’m done with the book, but just what I’ve read so far has me pin­ing for sim­pler times. 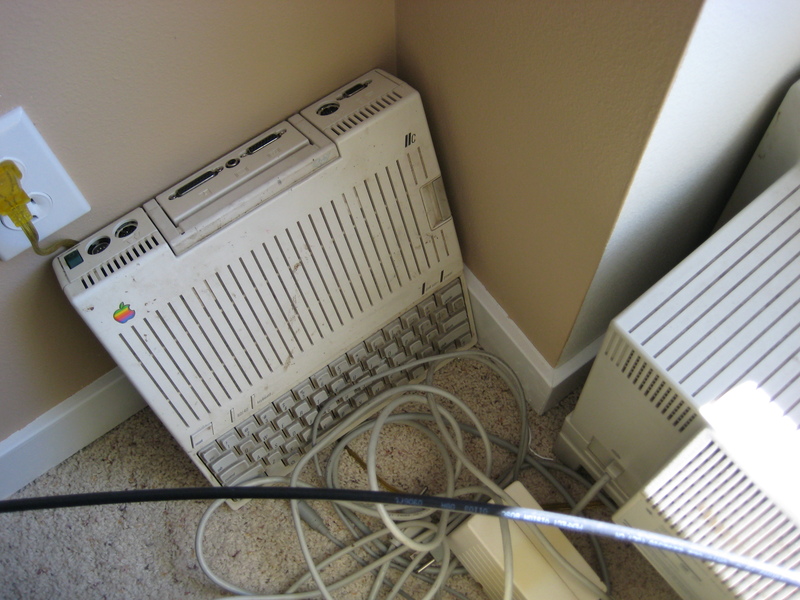 Before I knew acronyms like CCIE, OSPF, NX-OS and had a glob­al enter­prise net­work to tame, I had my Apple II, the Com­modore 64, the Ami­ga 1000 and the Atari ST. They say you can’t go back again, but I’m try­ing. This post will be a short one, and most­ly just comes from a dis­cus­sion I had the oth­er day with anoth­er engi­neer. It turns out that even among peo­ple who are com­fort­able with IPv6, and maybe even have expe­ri­ence deploy­ing it, a lot of mis­in­for­ma­tion still per­sists. Hope­ful­ly I can cor­rect a cou­ple of those today. I also tossed in a hot-pota­to at the end just to see how many folks get hopped up. Dis­cus­sion is wel­come, and in addi­tion to com­ments here I can be found on twit­ter hid­ing behind the han­dle: @someclown. 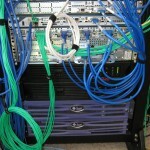 You must turn on IPv6 by using the IPv6 uni­cast-rout­ing com­mand. Not true. This is one of the more per­sis­tent, yet wild­ly incor­rect, pieces of infor­ma­tion regard­ing IPv6. I have even seen many train­ing cen­ters and instruc­tors at the CCIE lev­el get this one wrong and it falls into the cat­e­go­ry of atten­tion to detail. 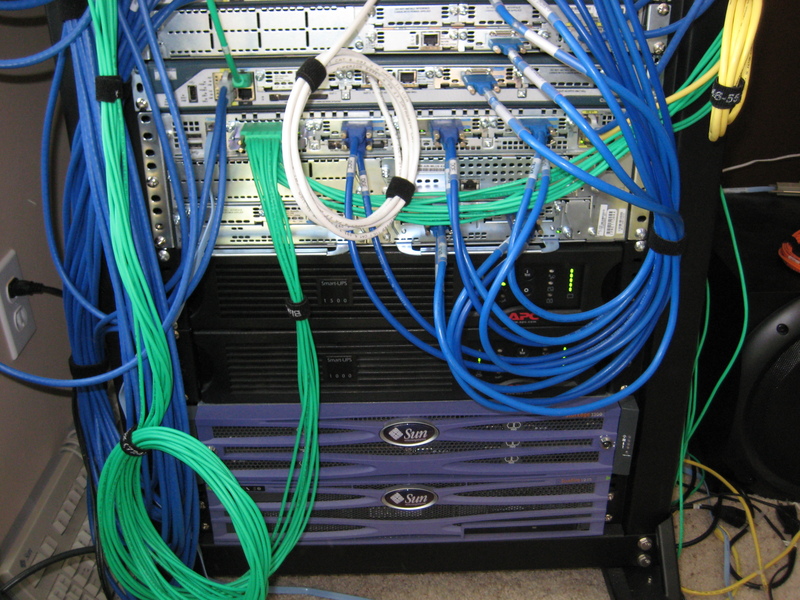 What this com­mand actu­al­ly does is enable uni­cast rout­ing for IPv6, just as it says. To actu­al­ly enable IPv6 you sim­ply need to go to any inter­face and use the ipv6 enable com­mand. And yes, you can enable IPv6 on the inter­face with­out enabling uni­cast rout­ing. Of course, it would be help­ful to have an address on the inter­face as well. 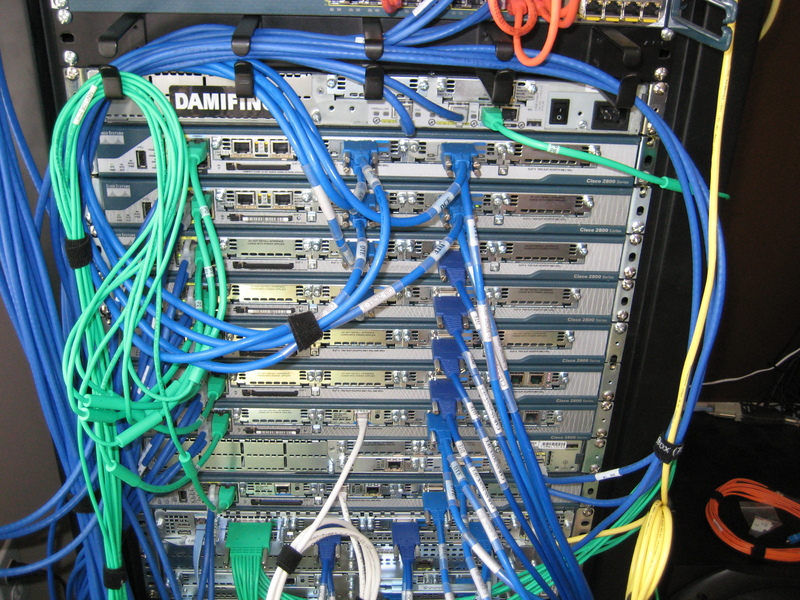 Yes, but if you don’t turn on uni­cast rout­ing you can’t route IPv6 traf­fic. Not strict­ly speak­ing true. You can still set up a default route for IPv6 traf­fic and get it off of your sys­tem. To the extent that you want to argue whether or not this is actu­al­ly rout­ing is fine, but you can move IPv6 traf­fic off of your local device using a default route, and nev­er have enabled rout­ing for IPv6. Using a /127 address on point-to-point links is wrong, wrong, wrong. This is an inter­est­ing one, and usu­al­ly sparks a fair amount of debate. Up until very recent­ly, the rec­om­men­da­tion across the board (RFC 4291) was to use /64 address­es even on point-to-point links, osten­si­bly because the IPv6 space is so big any­how, and because sev­er­al pro­to­cols will break (notably sub­net-router any­cast, spec­i­fied in RFC 3627). While I’m not dis­put­ing that this is what the cur­rent best-prac­tices reflect, I will say that RFC 6164 which has a sta­tus of Pro­posed Stan­dard makes a fair­ly com­pelling case for using /127 on point-to-point links. I’m sure this won’t be resolved any­time soon, stan­dards or no, but I would say that if you have a com­pelling rea­son for using /127 and know what you’re doing it for, go for it. Just be aware that stan­dards can change, and you don’t want to leave a steam­ing pile for the poor per­son who has to fol­low you. (1) My study hours don’t always match well with what slots the online rack ven­dors have avail­able. 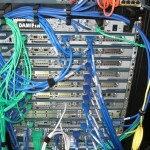 (2) I just like phys­i­cal equip­ment and the flex­i­bil­i­ty it pro­vides in both study­ing and in research. With that said, one of the next things peo­ple want to know is what gear it is that I have, and how do I have it con­fig­ured. There­fore, with the recent post­ing fre­quen­cy here severe­ly lack­ing, writ­ing about my lab is a nice way to get some­thing fresh on the blog and hope­ful­ly it pro­vides some­thing use­ful to some­one out there. 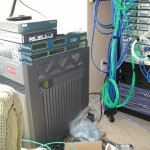 I’m going to break this down into two gen­er­al cat­e­gories: equip­ment that I have pure­ly for my Cis­co CCIE lab, and oth­er equip­ment that I have either for my home net­work or for ran­dom rea­sons. ASA 5505 with IPS mod­ule, run­ning bot-net fil­ter and some oth­er things. 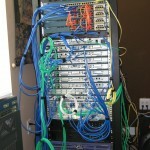 This is also the main gate­way for the home net­work, con­nect­ing up to the cable modem. 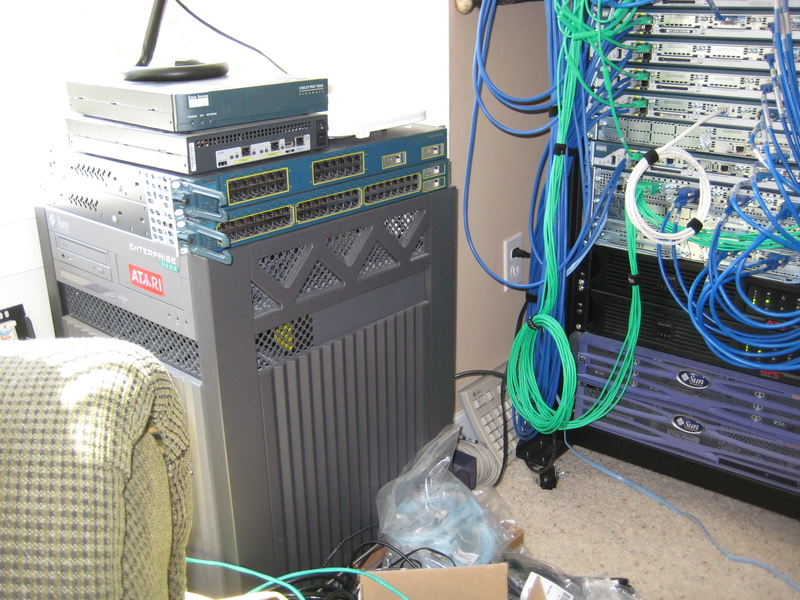 It’s also the IPsec end­point for my always-on con­nec­tion to the office and seg­ments my home net­work, lab net­work, work net­work, etc. 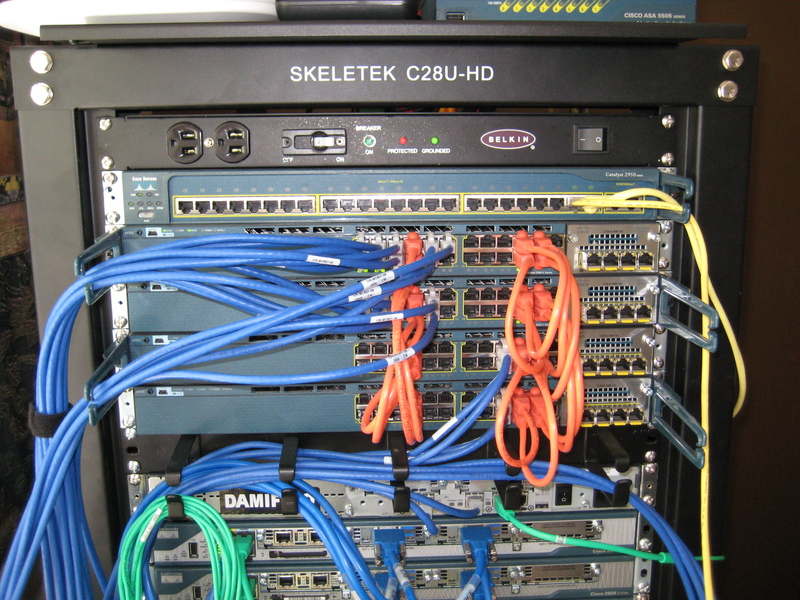 Four 3560-X switch­es, with four-gig uplink mod­ules (might still get the 10 at some point), ful­ly licensed with IPSer­vices and run­ning 12.2(53) SE2. 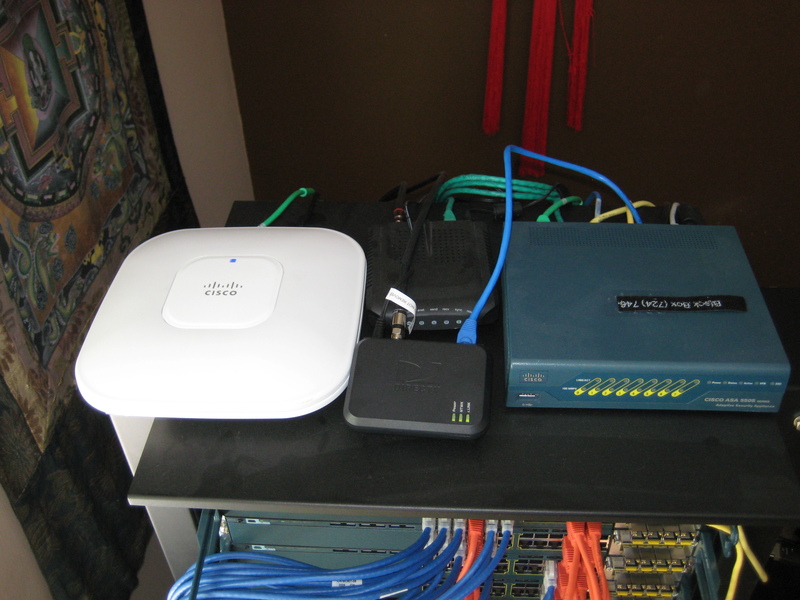 One 2811 run­ning the same IOS as the 2801 routers, used as a back­bone router for inject­ing routes and some oth­er misc. stuff. 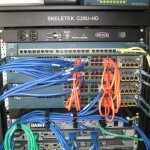 One 2621 run­ning some­thing-or-oth­er and act­ing as anoth­er back­bone router. One 3845 run­ning the same Advanced Enter­prise as the oth­ers. This has five Wic-2T cards and acts as the frame switch. 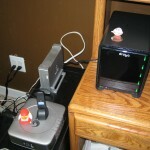 It also has an HWIC-16A card and does reverse-tel­net to every­thing else (ter­mi­nal serv­er). It also hous­es some ran­dom stuff includ­ing the wire­less con­troller men­tioned above. 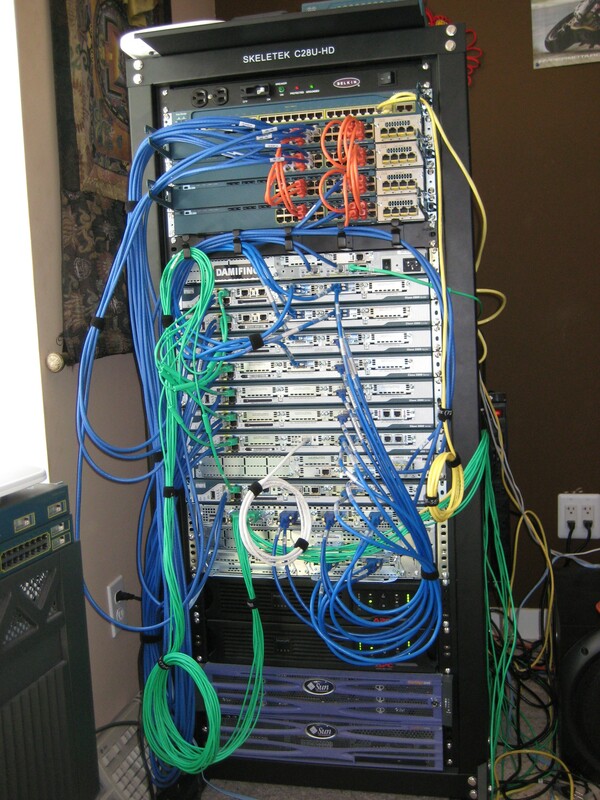 All of this is cabled and wired almost iden­ti­cal­ly to the CCBoot­Camp lab topol­o­gy. This is because I have all of their work­books and want­ed to be able to study with my own equip­ment. 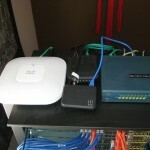 A cou­ple of the details are dif­fer­ent, most­ly around inter­face num­bers and the specifics of the back­bone routers and such. 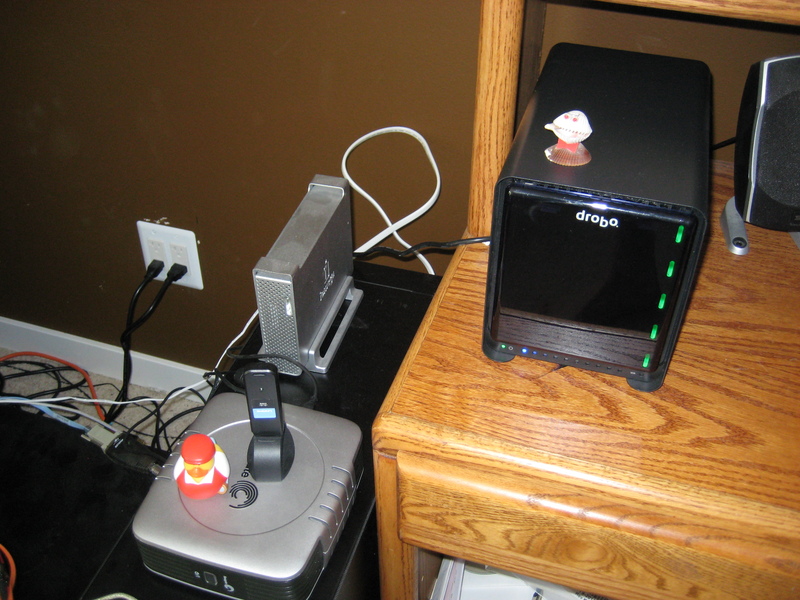 Also, the switch­es I have are way overkill but sat­is­fy the lab require­ments. Giv­en the actu­al topol­o­gy from just about any main­stream train­ing provider, I can copy it with the equip­ment I have, and that’s exact­ly what I want­ed to be able to do. As always, con­tact me here or on twit­ter with ques­tions and com­ments. Pic­tures of the lab and sun­dries are includ­ed below. Every­one has been post­ing their sched­ules for Cis­co Live to Twit­ter, Face­book and wher­ev­er else, so I thought I’d bet­ter jump in with the cool kids and pub­lish mine as well. I can’t guar­an­tee this won’t change, but for now it stands as my best guess and cur­rent planned sched­ule.